You can't be without a perfect guitar amplifier if you want to enjoy your musical time. Our guitar amplifier will satisfy your desire with its wonderful sound effect. Equipped with a soft plastic handle, this guitar amplifier is easy to carry and portable. Plastic protection and rubber foot pads on its corners will prevent it from clash and scraping. 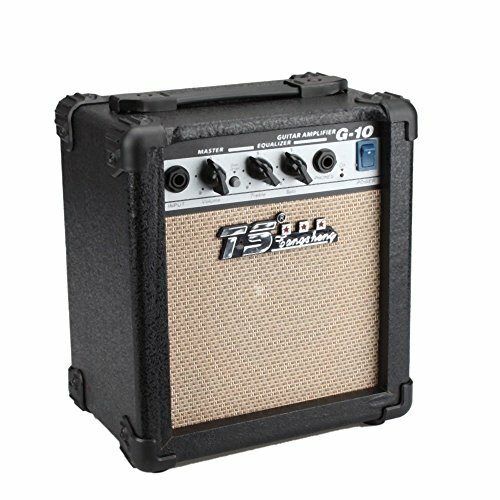 Maximum output power of this guitar amplifier is 10 watts while there are VOLUME, TREBLE and BASS Controls to adjust the sound volume and effect. And little switching noise will be produced when you start it.